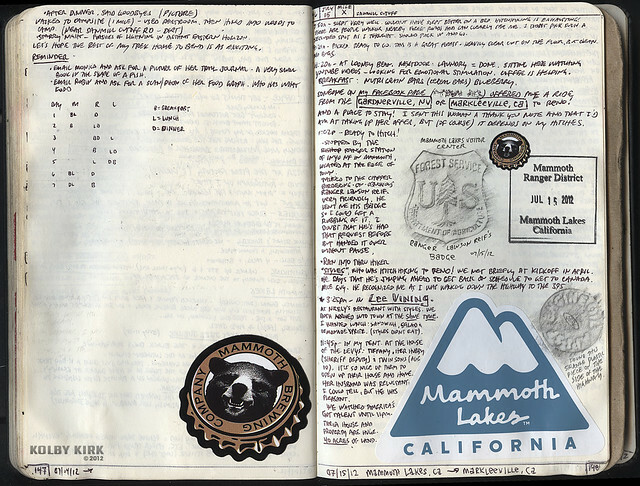 During my 6-week trek through the Sierra Nevada Mountains of California, I diligently kept a journal. Unlike previous backpacking trips, I opted for a larger journal. 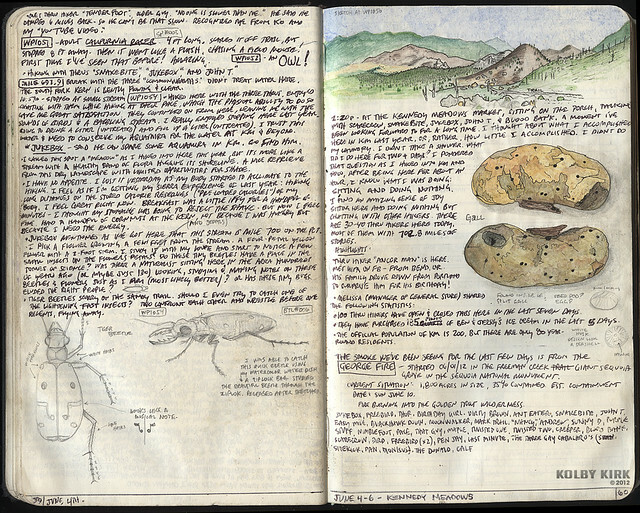 I’d like to share with you my experiences in the wilderness and a few scanned pages from my Sierra Trek 2012 journal. Page 01-02– Here’s the first two pages of my journal. Technically, this is the pastedown (left) and the front free-endpaper (right). With all my journals, I like to sketch something on these first pages that represent my trek as a whole. In the past, I’ve drawn a monkey in my Nicaragua journal, a camel for Morocco, and a moose for Nova Scotia. For this book, I decided to paint a representation* of what I had been feeling for the last 10 months, what the Germans would call fernweh. 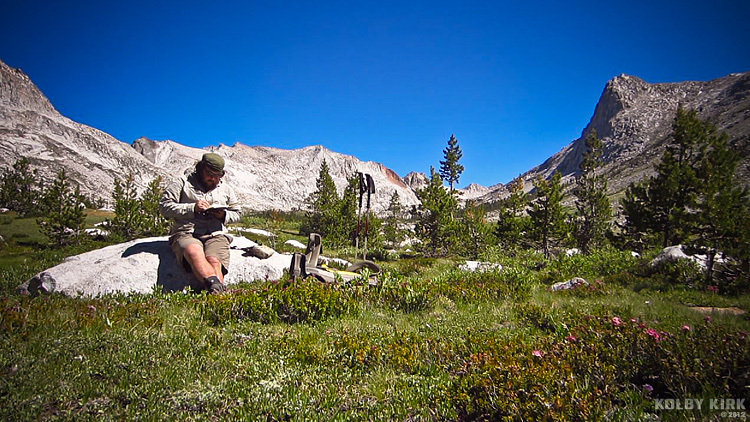 The longing to return to the mountains was a powerful feeling ever since stepping off of the Pacific Crest Trail in October 2011. The unfinished sketch on the right page is based on a photo I took while hiking through the Sierra last summer: A Prettyface flower (Triteleia ixioides) which is only found in the Sierra. I hope to finish this sketch in the near future. Page 03-04– I find it hard to get a journal going, so to help inspire myself to write in it, I add sketches/interesting items in the first few pages of the book. I brought my watercolor pencil palette with me on this trek. I experimented on what each color would look like the more I let water sit on the pencil. This color palette (left) came in handy while on the trail for helping me decide on which paint to use and how long to soak water on the paint. 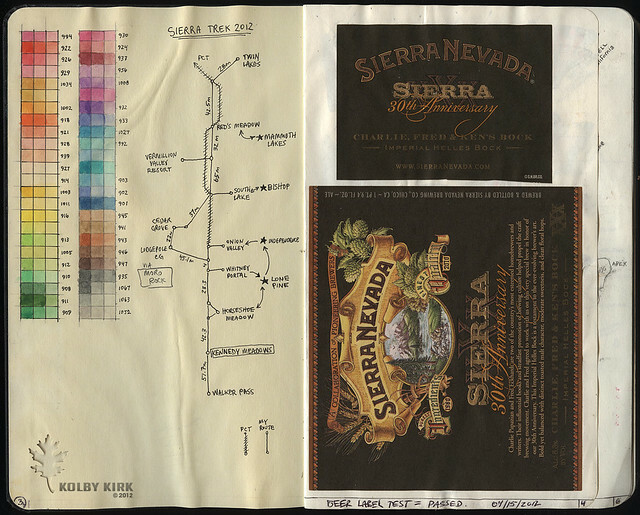 The beer labels are from a bottle of limited edition Sierra Nevada beer which a friend gave me prior to the trek. I like collecting labels on my journeys, but this is one of the few that I’ve added before my hike. Page 05-06– This spread might look familiar to some of my followers. I originally scanned this page in January soon after painting it. 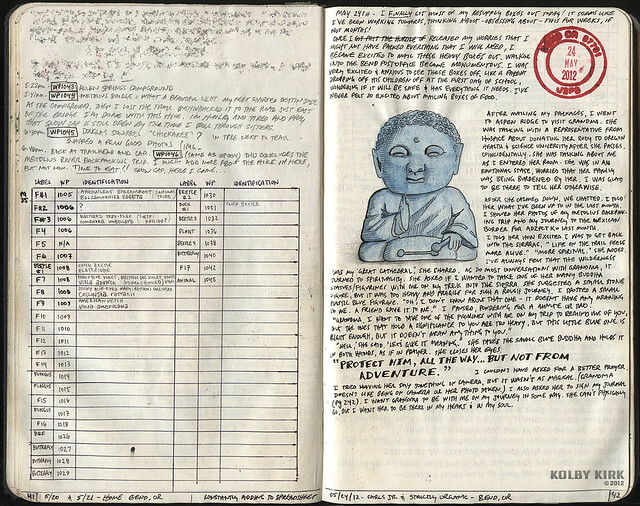 (I blogged about it here) This is a recent scan of the same page, to show you how it fared on my 350-mile hike. I expect my journals to physically represent my journey, showing evidence of toil on such a long backpacking trip into the wilderness. So paint smudges, a deteriorating spine, sweat stains, and dirt smudges on the pages make the journal more honest in telling the story of my journey. 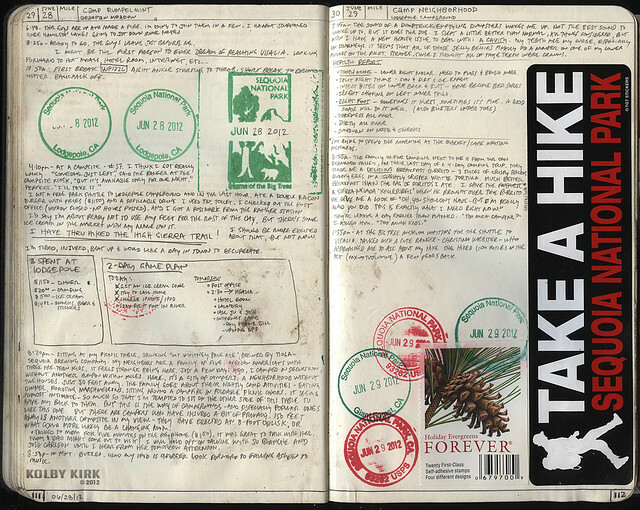 Page 07-08– I consider the pre-trip planning an important aspect of the journey and, as such, should be recorded in the same journal I carry on the trail. 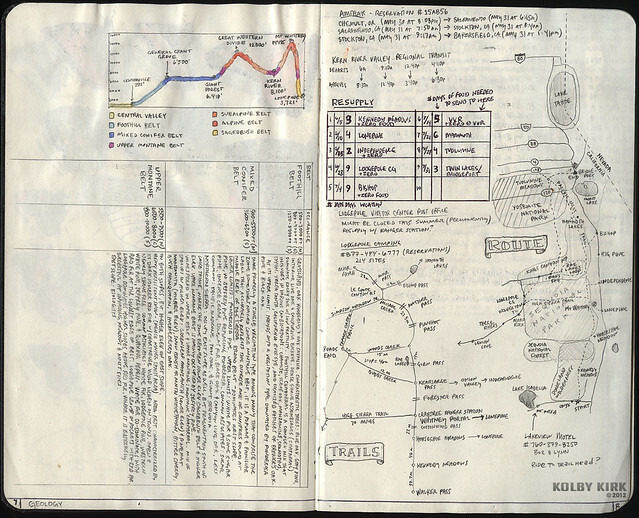 Not all journeys work out exactly as planned, so having these notes handy help in finding alternatives to the original route. On the right is a rough mileage map of the trails I plan on taking and the nearby alternatives. On the left are notes on the ecology of the Sierra Nevada. 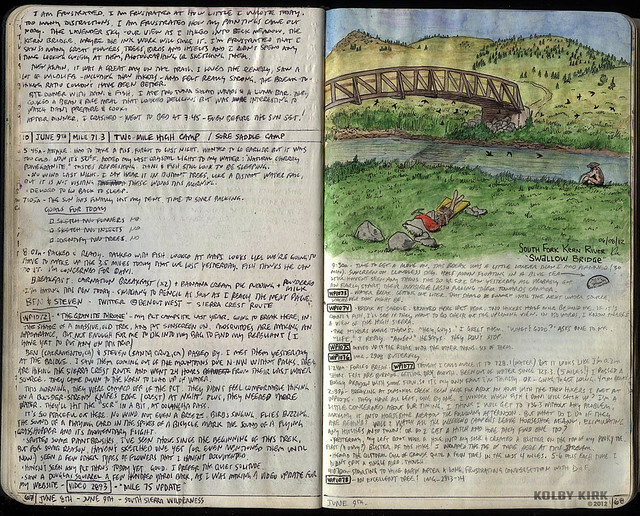 Page 47-48– Everything on this page was done on my first day on the trail. Unlike previous treks, I used a mechanical pencil (Staedtler Mars Drafting Technical Mechanical Pencil,0.5mm width) using 3B graphite, which I found best for my needs. Along with the mechanical pencil, I also brought a ballpoint pen (my ink of choice) for warmer days when the ink would flow well. Page 59-60– On all my hikes, I try to spend time studying the flora and fauna. Almost immediately, I had magical encounters. Within the first week, I saw a bobcat, owl, pine martin, snakes, lizards and a menagerie of insects. 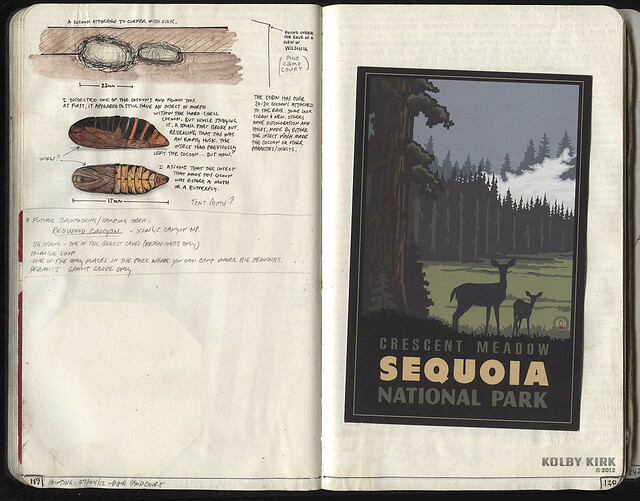 Included on these pages are sketches of a tiger beetle and a wasp gall. 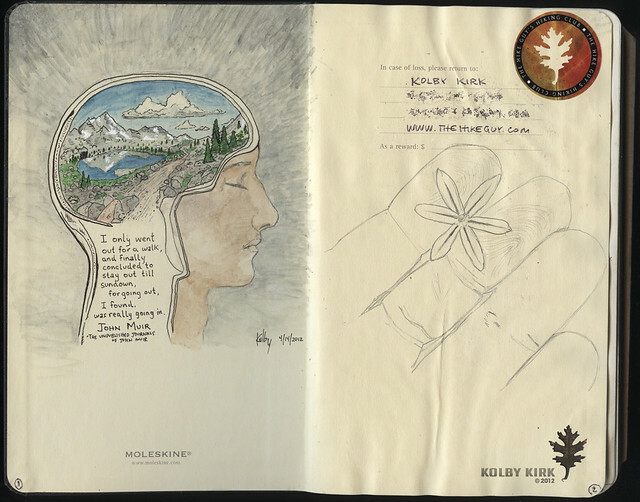 Page 67-68– I enjoyed the real estate that a Moleskine Plain Notebook Large, especially when comparing it to the pocket Moleskine I usually carry. I spent a few minutes sketching the footbridge that crosses South Fork Kern River, nicknamed “Swallow Bridge” by hikers for the birds that nest in its underside. When I finally returned home from my journey, I painted the sketch with watercolor, pen & ink. Page 101-102– Early in my trip, I was still trying to balance out my desire to sketch with my desire to move up the trail. For the first two weeks of the trek, I concentrated more on raising my fitness level, squeezing in time to write and make rough sketches when I could. 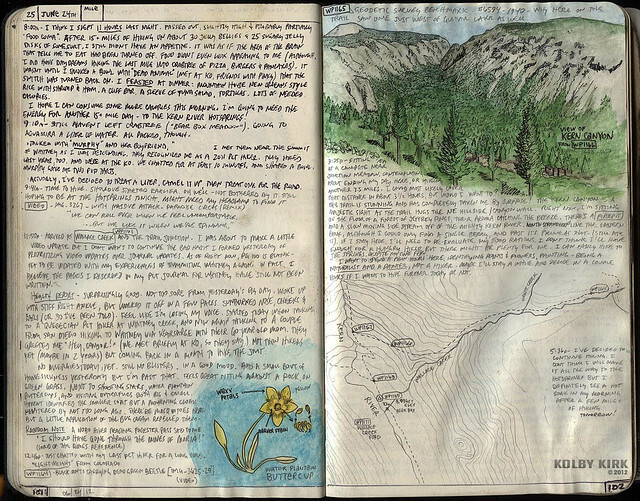 On this spread, I sketched with pencil on the trail then used watercolor, pen & ink after the trek. I made my own topo map on the trail when entering Kern River Canyon from the east.I liked drawing maps to create a stronger personal connection to the geography of my surroundings. Page 103-104– Instead of picking and pressing flowers in my journal as I did on trips of the past, I decided to paint them instead. These wildflowers of the Sierra were painted on the trail and once identified, were a useful key for the rest of the trek. I find that sketching flowers for identification requires an eye for detail. By the end of my trek, I was able to identify dozens of flowers thanks to the time I spent studying/sketching them. Page 111-112– I’m always on the look out for ephemera to slip into my journal when I hike back into civilization to resupply. I hiked into the popular side of Sequoia National Park and stamped my book both at the park’s visitor center (left) as well as at the small US Post Office (right). 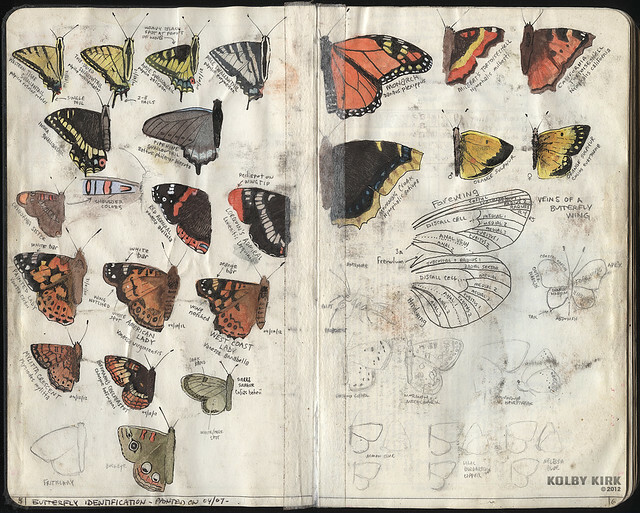 Page 119-120– Here’s a sketch of a tent moth cocoo followed by dreaded blank space. Although I have an easy time journaling on the trail, I struggle to push pen to paper while in towns taking “zero” days, or days of rest without hiking. I’ve talked with many hikers about journaling and they admitted that it’s these trips in towns that kill their hiking journal. They don’t take the time to write and, after a handful of life’s experiences slip by the pen, the white pages of the journal become intimidating and they never touch the book again. I solve this by skipping a few pages with the intention to fill them in later but, more importantly, I begin writing again. I cut my losses and begin again. I still hope that I take the time to fill in the gaps now that I’m home. The longer I wait, the more of the details will fade from memory. Page 147-148– Along with a mechanical pencil, I carried a stub of a wooden pencil so I could do some rubbings in my journal. When I was in Mammoth Lakes, CA I asked a ranger if I could borrow his badge. Surprisingly, he handed it over so I could get a rubbing of it. I wish I had done the same with the National Park Ranger badge – I had many opportunities to ask – but this idea didn’t occur to me until later in my journey. The other rubbing on this page is of an interesting plastic piece I found on the side of the road while hitchhiking home from Bishop to Bend, Oregon. 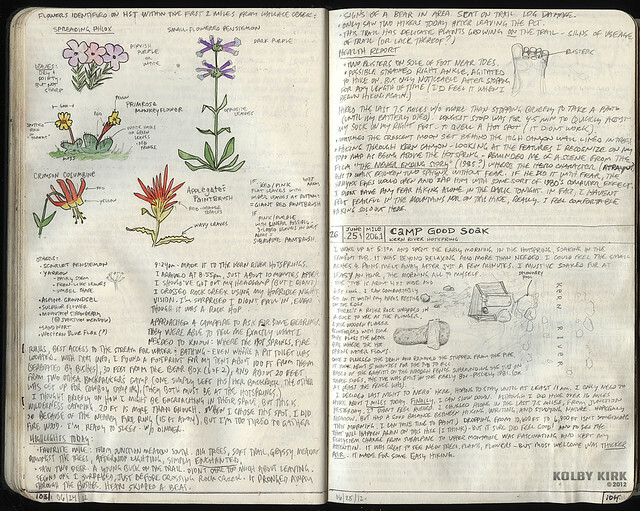 Page 239-240– All of my hiking journals begin with a hand-drawn spreadsheet in the rear of the book. 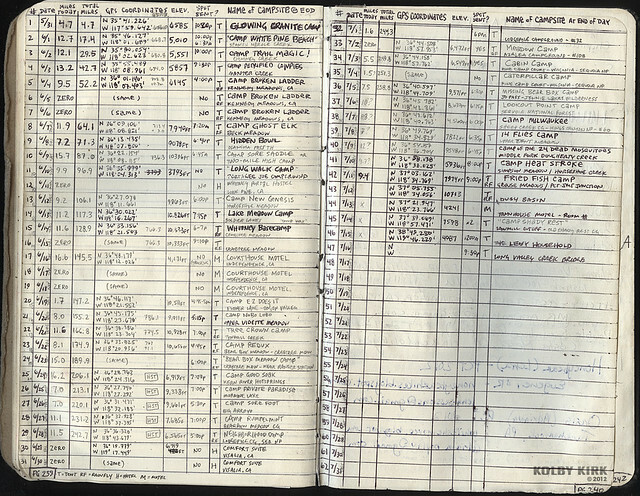 It is these pages that I access the most, adding in daily data such as mileage, coordinates and elevation of my camp. I also named each camp, as the explorers of eld once did. I still have a bit of work to do on this page, calculating daily mileage using my GPS data, but this gives me an opportunity to review my trek, an important step in any major journey. Page 241-242– The last pages of my journal are reserved for those I meet. An autograph page, of sorts. 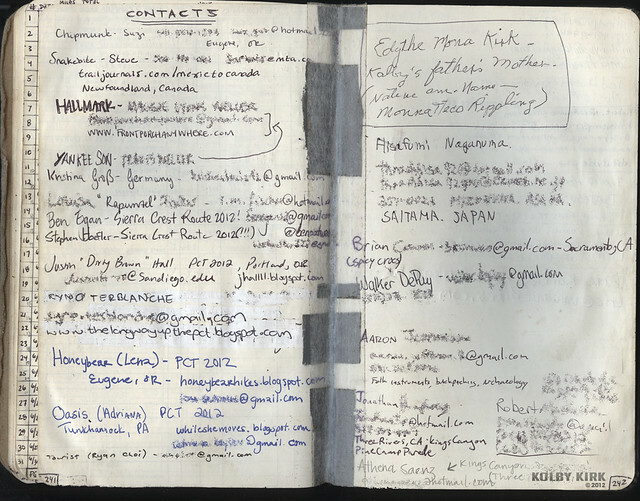 I prefer that the hiker writes their information with their own hand, connecting their journey to mine in a more personal way. I hope I have given you inspiration to start a journal or ideas to include in your own journal keeping. Feel free to share your feedback below. *This artwork was based on another work, but I couldn’t find the artist responsible.